This entry was posted in Agriculture, Media, Status Quo. Bookmark the permalink. Personally I don’t like things like Proposition 2 because the unintended consequences of government regulations have tentacles that usually end up hurting those that the well intentioned rules were meant to protect, while the big corporate giants deftly maneuver within the new guidelines. You think a few new rules are going to effect a Tyson? They’ll just spend the necessary billions to adapt. What about the artisan veal farmer? Or the small foie gras farm? What if new rules like these effect the quality of their product, and thus their sales? I guess we can take solace that they can at least sell out to Cargill and move to the suburbs. Vines & Cattle – As far as I understand it, Proposition 2 is meant to protect animals, not producers. Likewise, the goal of the bill was not to put Tyson out of business. If there are small producers who, like Tyson, aren’t giving their animals enough room to turn around in their own feces, then I hope you are correct in your fear that they will be affected by the bill. Even small family farms don’t have a right to abuse animals so that those of us in the suburbs can have a piece of specialty meat. Tricia – I don’t think I like arugula. Can you saute it like spinach or chard? I might like it that way. 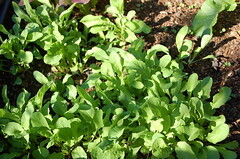 Also – I think you can saute arugula. It should hold up. I hope you are correct in your fear that they will be affected by the bill. Even small family farms don’t have a right to abuse animals so that those of us in the suburbs can have a piece of specialty meat. You can do far more by choosing what foods you buy according to how it’s raised rather than forcing mandates on people. That smells of a certain totalitarianism, but hey if you know better for people I guess it’s your right to enforce your views on them. I couldn’t agree more that people should vote with their money, so to speak, and I do. But I also think that a government that doesn’t look out for those who can’t look out for themselves isn’t one worth having. And this issue goes beyond animals. Consumers have a right to know how their food is being produced, and there are good reasons to believe that CAFOs lead to the production of potentially hazardous and inferior products over the long term. Bills like this one also serve to educate, bringing issues to the forefront so that citizens can make informed decisions and purchases. I can not think of Arugula with out thinking of My Blue Heaven.